Our SPARKe mobile workstations are hygienic and safe. A lockable box protects the laptop inside from theft, dirt and liquids. The workstations are easy to clean and are designed so they don't have any sharp edges or corners. ​All SPARKe mobile workstations are equipped with 4 swivel castors, two of them with brake. Because of the small dimensions, the SPARKe Trolleys are easy to handle. The laptop can be installed easily and tool-free. Our mobile workstations are easy to adapt. 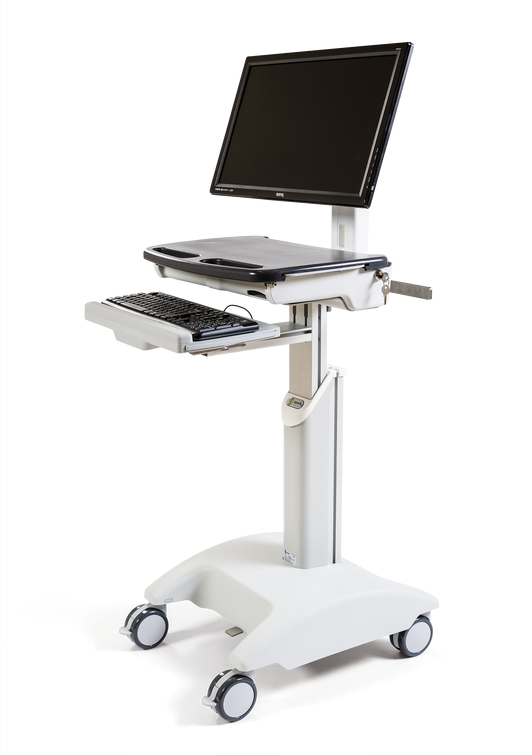 Thanks to their height-adjustability they can serve as a workstation for both sedentary and standing work. There is a broad range of accessories available to equip the trolleys according to your needs. Please choose from the different models in our brochure below.